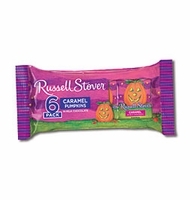 Caramel pumpkins by Russell Stover. Get a 6 pack of milk chocolate pumpkins filled with a creamy caramel. Caramel pumpkins are the perfect Halloween candy for anyone who loves chocolate and caramel.